Japanese Standard Chisels "Oire Nomi"
Skip this Text The renowned metal-working arts of Japan are reflected in Japanese chisels. Blades are made in two parts: a softer iron body, extending into the handle, and a hard steel cutting piece hammer-welded to the body. Blades are hollow-ground to make sharpening easier. An often-asked question is what to do when the blade is ground down so far that the hollow reaches the cutting edge. This is actually not a problem - regular sharpening and honing of the face moves the hollow back so that a straight edge is automatically maintained. In fact, overenthusiastic sharpening or grinding of the face by some users enlarges the flat between the edge and the hollow-ground part of the chisel. 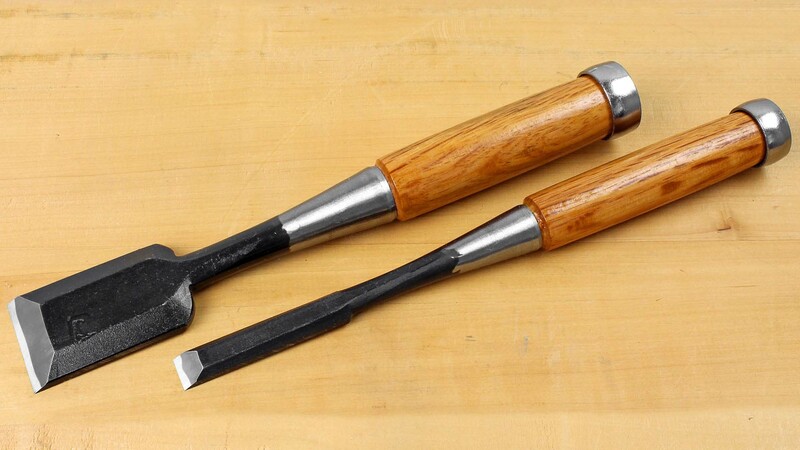 These chisels are customarily driven by steel hammers in Japan, but the usual wooden mallet will serve just as well. 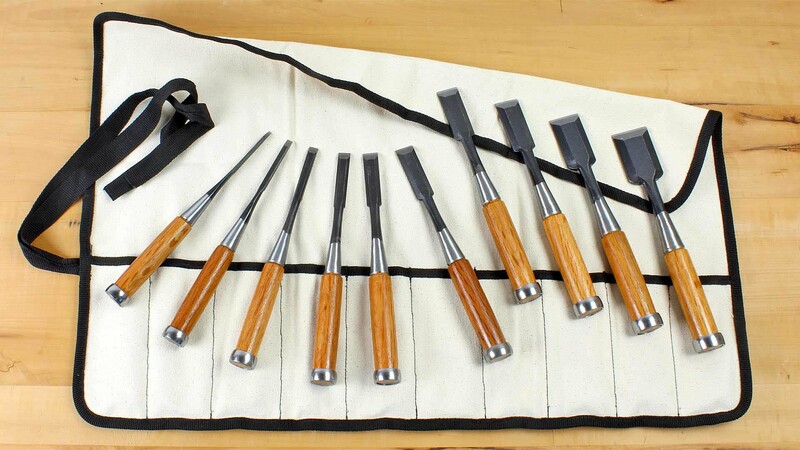 The total length of all chisels offered on this page is 22 - 23 cm (8-13/16 - 9 inch). Koshimitsu brand chisels in "white steel". These are made of the renowned "Hitachi Yasuki Hagane No. 2" steel, carbon steel with special properties, very densely-grained, and both harder and tougher than the usual carbon steels. "White steel" will take the sharpest edge of any steel; these chisels are therefore suitable for the very finest and most precise work. They are made by Master blacksmith Matsumura in Yoita, Province Niigata. 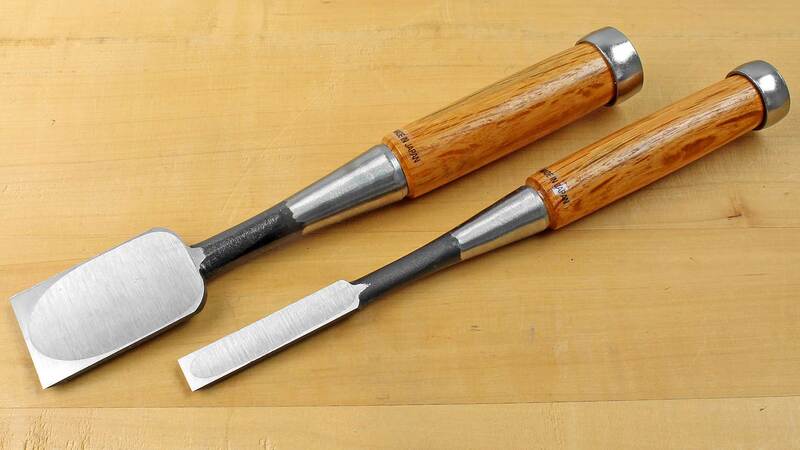 Kunikei brand chisels in "white steel". These are also made of the renowned "Hitachi Yasuki Hagane No. 2" steel, carbon steel with special properties, very densely-grained, and both harder and tougher than the usual carbon steels. 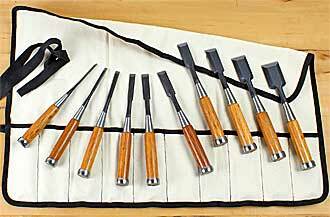 These chisels are suitable for the very finest and most precise work. They are made by Yoshiro Ikeda in Sanjo, Province Niigata. 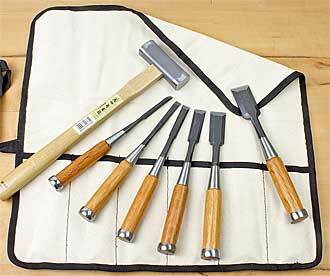 Kunikei chisels are aesthetically topline and therefore more expensive. High-speed steel (HSS) chisels. Until recently, no chisels were made of high-speed steel, because the material was too coarse-grained to take a truly sharp edge. However, manufacturers have now succeeded in producing high-speed steel sufficiently fine-grained to take and hold an edge. 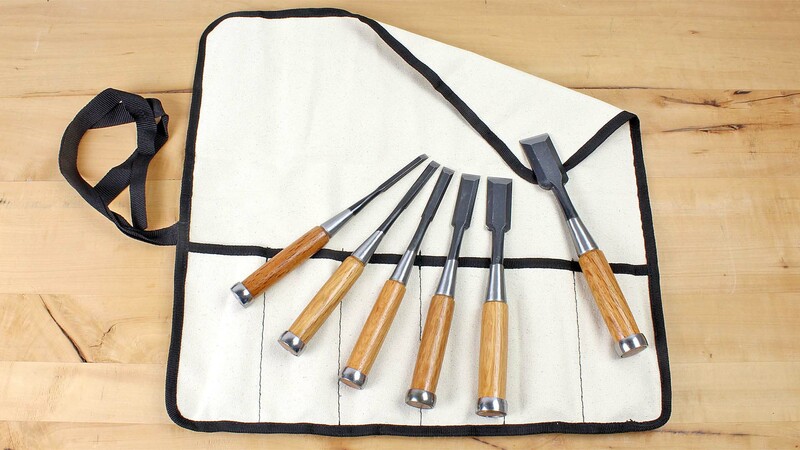 These chisels can be sharpened to a very fine edge but their outstanding feature is their ruggedness. Carbon steel blades can be nicked fairly easily if not properly used. High-speed steel chisels, on the other hand, will take abuse with little concern that the blade will be damaged. They do require, however, slightly more effort to sharpen than carbon steel. Daitei brand Chisels made of "Blue Steel" "Blue Steel" is a little different from the "white paper steel" that is used in some of the other high-quality Japanese chisels and plane irons we sell. Blue steel has a carbon content of 1 - 1.5%, chrome 0.2 - 0.5%, and 1 - 1.5% tungsten. Chrome reduces wear, and provides rust resistance (although given the tiny amount of chrome in this alloy, one cannot consider it stainless steel) and aids in quenching the steel after hardening. 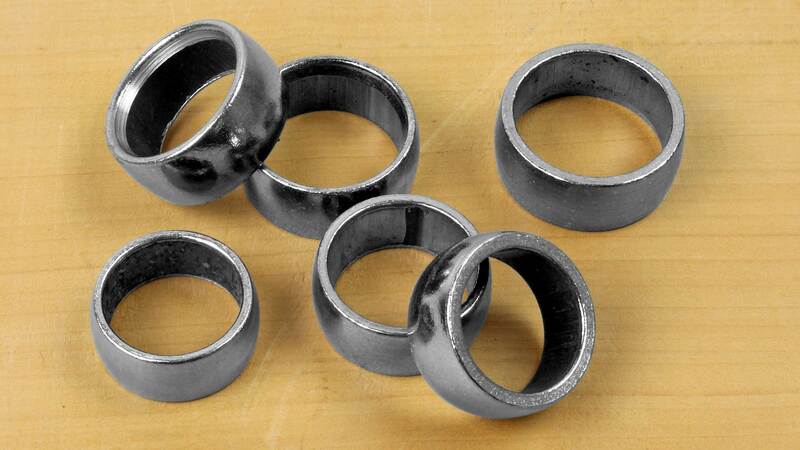 The tungsten adds hardness to the alloy. The chisel as art. Blade made of "Suminagashi," the Japanese version of damascened steel, with its layers prominently displayed; handle of sandalwood; a feast for the eye! It goes without saying that the cutting edge is carefully hardened and tempered. Note: Do not omitt to have a look at our sharpening directions for Japanese Chisels. Japanese Slicks "Sashi Nomi" you will find here! Click pictures for enlargements! 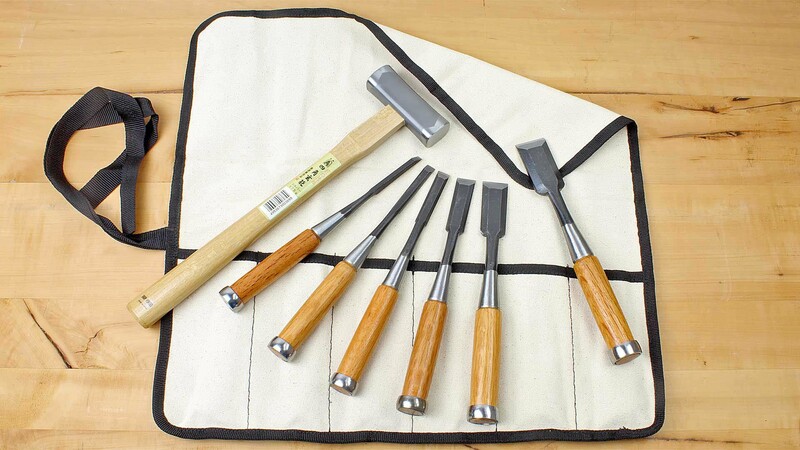 These chisels are customarily driven by steel hammers in Japan. We included a hammer with a head weight of 375 g (nr. 309705). This is the steel ring or ferrule which holds the wooden handle of chisels together under the blows of the hammer or mallet. 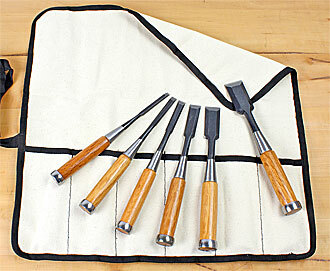 Whether you have lost one or are processing your own chisel making project, here you find the right one.